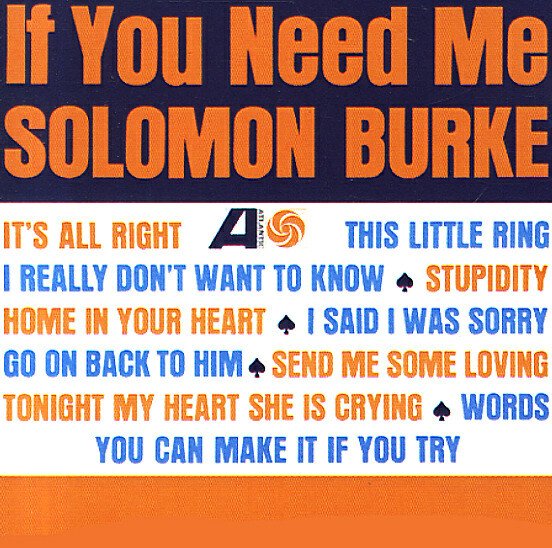 Seminal sounds from Solomon Burke – and a record that already has the young singer hitting the full heights of his greatness! There's a vibe here that's unlike anything else – even any of Burke's heavy-hitting contemporaries on Atlantic Records – and the album's key proof that Solomon's easily one of the greatest soul singers who ever lived! His vocals have roots that go very deep, but the strength of his vocals also help bring a new focus to 60s soul as well – a raw power that so many others would try to emulate, yet maybe never hit as well as Burke. A number of cuts here are great originals penned by Solomon, and every number's a gem – with titles that include "Stupidity", "Words", "If You Need Me", "Home In Your Heart", "Tonight My Heart She Is Crying", "I Really Don't Want To Know", and "Send Me Some Loving". © 1996-2019, Dusty Groove, Inc.